Accomplished admission requirements must be personally submitted to the UST Graduate School Office during the application period or at least a month before the enrollment starts. Documents, such as transcript of records (TOR) and application forms submitted via electronic mails are not allowed. 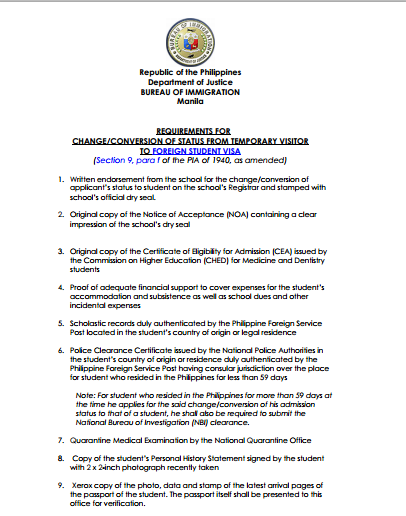 Foreign applicants may send the admission requirements via international courier services. In general, an applicant with a general weighted average not lower than 2.00 (85%) or B in the bachelor’s program may be admitted to an M.A./M.S. program. An applicant with a general weighted average not lower than 1.35 (92%) or A- in the master’s program may be admitted to a Ph.D./Ed.D. program. Based on the results of the admission examination, a student may be required to take Advanced Academic Writing (3 units) as a prerequisite course to the program, subject to the following:Passing the bar/board examinations is a requirement for admission to Master of Laws, M.A. in Nursing, M.S. Pharmacy, and any other degree programs that require board examinations. A student required to enroll in Advanced Academic Writing may proceed to other courses in the program only after earning credit for it. However, other courses may be enrolled simultaneously with Advanced Academic Writing. The course Advanced Academic Writing cannot be waived as a requirement for the completion of the program. 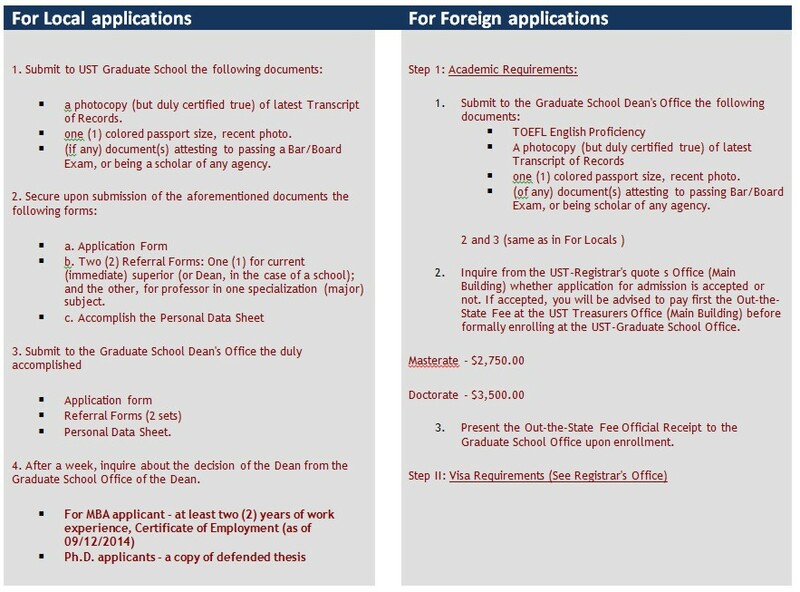 A foreign student, whether new or transferee, must pay the out-of-state fee, i.e., $2,750.00 for the master’s program and $3,500.00 for the doctoral program before formally enrolling. Payment of this fee may be in full or in an installment basis. A student who wishes to pay in installment may pay the out-of-state fee during the entire duration of the program. He/She, however, cannot graduate without a certificate from the Treasurer’s Office that he/she has settled the amount in full. The fee may be paid in dollars or in pesos. In the event that a foreign student discontinues his/her studies for whatever reason(s) during the first semester entry, the rule on dropping of courses is observed to determine adjustment of fees. 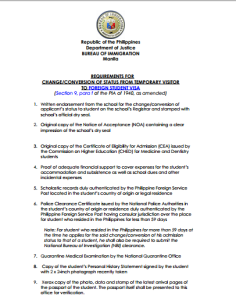 Moreover, if a foreign student suddenly disappeared for whatever reason(s) and fails to settle his/her accounts, no official record of his/her academic performance shall be released. There are some M.A./M.S. programs which require that the applicant take some undergraduate (foundation) courses as preparatory courses if his/her bachelor’s degree is not aligned with the M.A./M.S. degree s/he wishes to pursue. A student who wishes to pursue an M.A./M.S. degree not aligned with his/her bachelor’s degree should finish at least eighteen (18) units of foundation courses in the area of specialization (with grades not lower than 2.0 whether the courses were taken at the undergraduate or graduate level), subject to the approval of the program lead. Those in the M.B.A. and M.S.C. programs whose undergraduate degree is non-business or non-economics must take additional nine (9) units of foundation courses, namely, Principles of Economics, Principles of Accounting, and Principles of Marketing. However, there are master’s degree programs that require a corresponding identical bachelor’s degree, e.g., law, nursing. For example, but not limited to, a holder of a bachelor’s degree in Political Science cannot immediately apply in the Ll.M. program. This is in view of the fact that the Ll.M. requires both A.B./B.S. and Ll.B. degrees prior to enrollment in the Ll.M. program. Also, graduates of professional degrees like, but not limited to M.D., D.M.D., D.V.M., O.D., J.D. or Ll.B., must first take and obtain a master’s degree prior to their application to the doctoral degree program. The M.B.A., M.S.H.R.M., and any other management-related graduate programs require at least two (2) years of work experience prior to admission into the program. If an applicant wishes to pursue a doctoral degree not aligned with the M.A./M.S. degree already earned, he/she will be required to take additional M.A./M.S. foundation courses. Courses taken from another university without the approval of the UST Registrar’s Office and the recommendation of the Dean shall not be formally credited. An applicant who already possesses a doctoral degree and wishes to pursue a second doctoral degree must fulfill the following requirements: If the desired second doctoral degree program is not related to the previous master’s and previous doctoral degrees, the applicant is required to take at least 24 academic units in the master’s level, equivalent to nine (9) units of core and fifteen (15) units of specialization courses over and above the regular requirements for the doctoral degree. An applicant who wishes to pursue another M.A./M.S. or Ph.D./Ed.D. at the UST Graduate School must formally apply in the desired master’s/doctoral program. Prerequisite courses completed in the first master’s program, such as Thomas Aquinas and Critical Thinking and Research Methodology need not be taken again, but the applicant must take additional or parallel major/prerequisite courses in lieu of the prerequisite subjects completed before. Graduates of non-thesis track programs at the UST Graduate School or any other universities from A.Y. 2010-2011 to A.Y. 2014 – 2015 who wish to pursue doctoral studies at UST are required to enroll in six (6) units of bridging courses. At the end of the course, they need to submit publishable research papers and are required to publish these papers in reputable local or international journals before they are allowed to formally enroll in the doctoral program. Graduates of non-thesis track degree programs at the UST Graduate School or elsewhere before A.Y. 2010-2011, therefore, should finish a thesis-track M.S./M.A. program at UST or elsewhere should they intend to pursue their doctoral studies at UST. * Forms must be printed in the best possible print setting using either laser or ink based printers, 8.5 x 13 (long/legal) bond paper size. 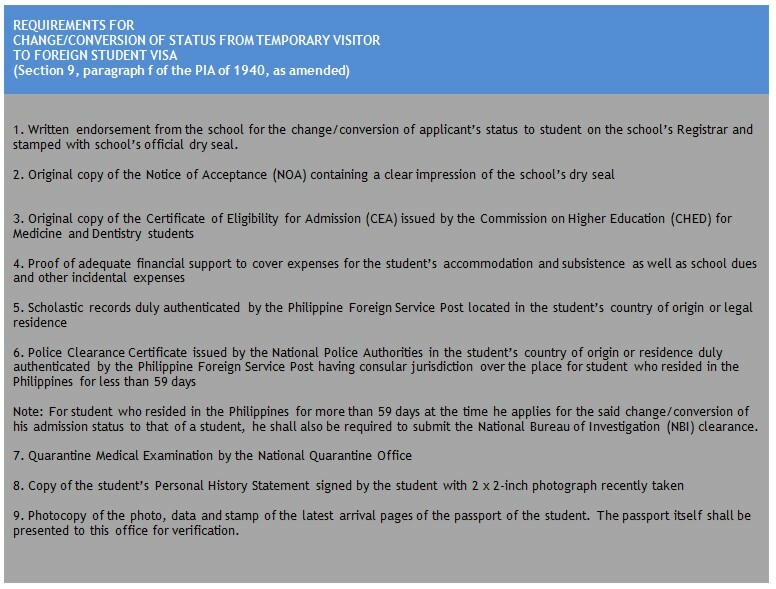 * Form subject for verification, falsification will result to automatic cancellation of application to the UST Graduate School.